As Shakespeare lies in the common domain, his plays are equally produced by scrappy small companies and major classical theatres. You can trim and rearrange and reinvent to your heart's content and even, dare I say, have a post-show talkback without receiving a cease and desist letter from the playwright. There are common pitfalls, however, to producing Shakespeare, and while I don't need to enumerate them all, some stereotypical setbacks remain with us. The dangers of well-established, prestigious companies doing Shakespeare is often the danger of too much stateliness underlying even productions replete with leather trousers. While the ensemble has been able to do their textwork with the best of the best, that assurance can sometimes lead to a lack of real choices or risks being taken on stage. The smaller companies generally produce Shakespeare without fancy costumes, sets, or prosceniums (where aesthetic choices line up with budgetary constraints), and lead with a big idea first--but sometimes fall short on their ability to see their vision through without access to the same level of resources or ability to cast their nets quite as wide. 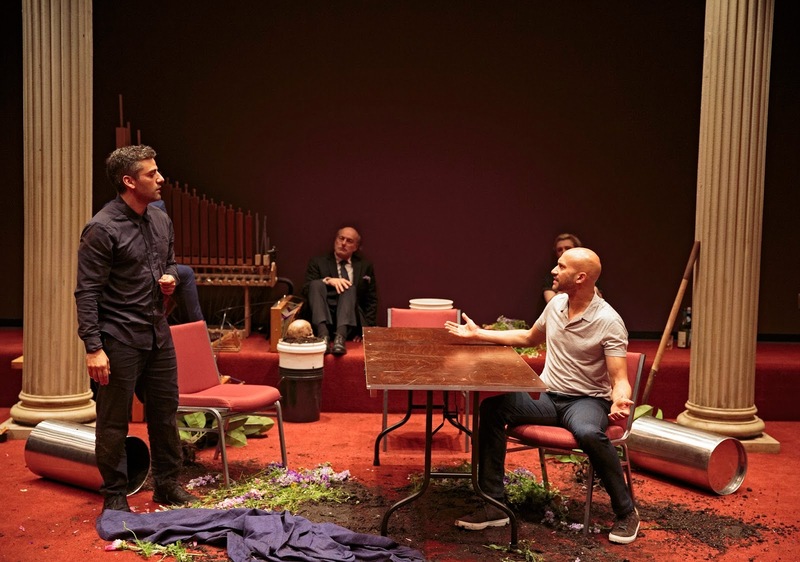 Oscar Isaac and Keegan-Michael Key (foreground), and Peter Friedman and Gayle Rankin in Hamlet, directed by Sam Gold, running at The Public Theater through September 3. Photo credit: Carol Rosegg. There are of course exceptions to these vast and sweeping generalizations, but in many ways, Sam Gold's production of Hamlet (yes, the one that was too hot for TFANA) succeeds at uniting the strengths of the scrappy small company aesthetic/vision with the resources and assurance that come with the backing of the Public Theatre. The play is housed in the Anspacher Theatre, which unites the Shakespeare-appropriate thrust stage with tiers of seating that feel inspired by the theatres of ancient Greece. Design work by David Zinn (scenic) and Kaye Voyce (costumes) is deliberately understated, and in the close atmosphere of the Anspacher, invites us into a rehearsal-room-like world where we encounter the play stripped of any extraneous show. Gold's Hamlet is rife with ideas that feel as though they were scrawled 15 years ago into a student copy of the play and have been percolating in his brain ever since. It's not a criticism, but it's not a feeling that you often pick up from artists working at this level. Not all of these choices work, but some of them made me gasp, such as a perfect and unexpected transition from one scene to another that felt like a coup de théâtre--and this from a play I've had half-memorized since I was 13. Gold's production does what so many of my favorite directors remember to do with Shakespeare, which is to never let his audience forget that this is theatre; it's not real, it was never intended to BE real, and if you trust it, the play will thrum with a special energy when the audience is reminded of that fact. I admit to a bias for Shakespeare that uses the staging conditions of early modern theatre, so when the first act was (largely) played with the house lights on full, you can imagine my delight. Soliloquies are addressed directly to the audience (as well they should be) and company members are double or triple cast according to need (of which there is a fair amount, when the cast numbers only nine and one of them needs to be Hamlet). 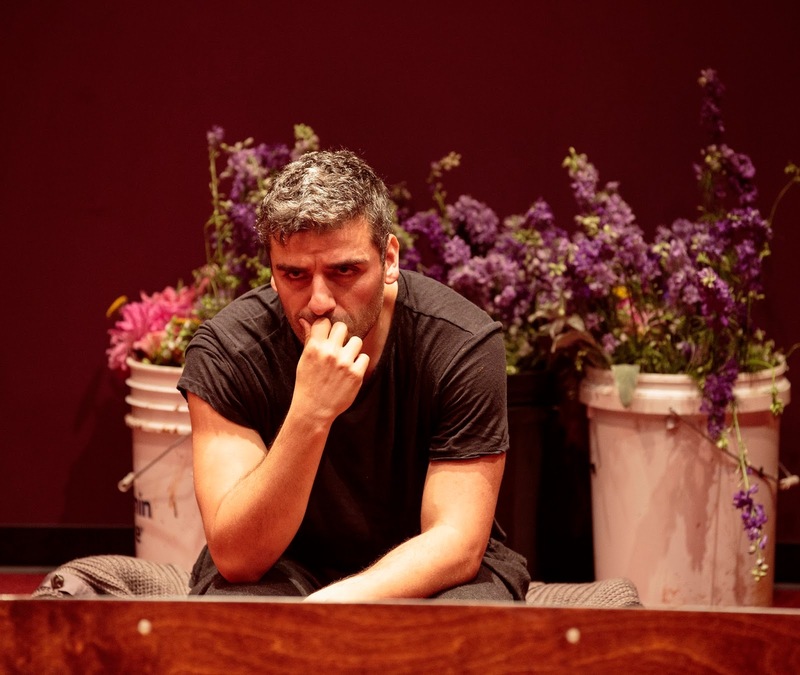 Oscar Isaac in Hamlet, directed by Sam Gold, running at The Public Theater through September 3. This Hamlet is tightly focused on Oscar Isaac's performance as the title character, eschewing the play's broader political world to give us a portrait of a man being slowly torn apart by impossible forces. There are major benefits to this approach, chief of which are that it puts the greatest weight on Isaac's able shoulders. His performance is magnetic and heartwrending by turns, so that the lightness of his early mad scenes sets up an absolutely devastating closet scene confrontation with Charlayne Woodard's excellent Gertrude (an actress familiar to DC audiences from performances at the Shakespeare Theatre Company). He has the wit to make Hamlet's jokes actually funny to an audience (no small feat) and the ability to brood with a deeply focused intelligence that never reads as a sulk (likewise). Keeping the story so focused on Hamlet does have its drawbacks, so that the final scene's body count feels strangely out of place in this story which just seems to be about a son from a troubled family. Shakespeare frames the death of Hamlet's father as a murder, not an assassination, true, but it's a murder that has vast political effects that add complexity to both the plight of Hamlet and the nation that waits just beyond the stage's limits. Taking away that dimension unbalances some of the foundation of the play, and other choices by Gold continue to dismantle that structure. For instance, while having members of the company double as the traveling players is no issue (rather, it's a delight to have Keegan Michael Key simply turn when called and reassume his role as Horatio), the play within a play sequence blurs the line between characters so much that the crystalline clarity achieved so beautifully in other scenes becomes lost. Some of this is certainly intentional, but not all of it succeeds as well as I imagine the director hoped. If you establish that Ritchie Coster's shirt or lack thereof denotes either Claudius or the Ghost, it feels like cheating to break the rules you establish for the audience because you want to make a different point. The production succeeds best when Gold prioritizes clarity over ambiguity. I've rarely seen a Hamlet where I could feel the audience follow the prince down each rhetorical move as clearly as in this production. It's so easy to forget that the old performer's adage remains absolutely true: in every audience, it's someone's first exposure to a work, and for others, their last. I watched the heads of both patrons in front of me nodding unconsciously along with the twists and turns of Hamlet's reasoning when he stumbles upon Claudius at prayer, and heard a gasp and a "oh no, it's the wrong man" when Hamlet drags out the body of Polonius only minutes later. In these moment's, Gold's direction makes the play sing. There's a restlessness in Gold's vision of Hamlet, one that shifts from act to act, building a world that disintegrates over the almost four-hour run time. In the first act, the play is strikingly performed in either shared light or darkness. By the second act, the house lights are down and fewer witnesses left on the periphery; by the fourth act, characters and audience are forced to confront the bodies of the dead positioned center stage; and in the final moments, all eyes (even those of the dead) are focused entirely on the dying breaths of Hamlet and the memorializing of Horatio. There are bones I could pick, moments I could point to quite clearly as choices that weren't to my taste, but Gold's Hamlet feels ultimately like a powerful entry into the four-hundred year history of this play on stage. When I occasionally think about why my heart has always been with classical theatre and Shakespeare in particular, it comes down to the way that centuries of accumulated performances build resonances over time. As a dramaturg, it's never my job to worry about finding a new way to envision a play that's probably not got a lot of room left for new ideas. Rather, as a theatregoer who has loved Shakespeare for most of my life, it's my pleasure to see as many different stagings as I can and build up as many layers of resonance as I can for each scene and character so that every time I encounter the play, I can remember different interpretations, staging choices, and particular line readings. Some of these resonances are with choices I disliked (I'm still angry about the lack of a unified theory of puppets in that Measure for Measure, Mr. P), but I already know that Sam Gold's Hamlet, and in particular Oscar Isaac's central performance, has enriched my trove of Hamlets. It feels like a treat to have seen it, and I only wish that the ephemeral nature of theatre performances didn't mean that so few of us will. If you have a chance of getting a ticket, grab it with both hands and get ready, then come talk to me afterwards.